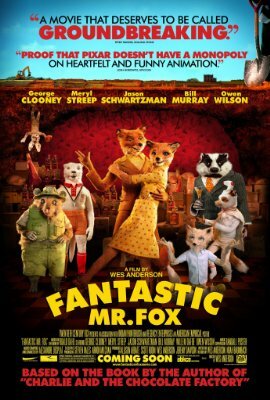 Fanstastic Mr Fox is probably my favourite Roald Dahl children’s story. So today I decided I’d go and see it at the Odeon in Liverpool 1 and crossed my fingers they’d not treated the source material as a slum clearance job it like Disney did with Bedknobs and Broomsticks. Given the source materials brevity it’s unsurprising they had to pad it to make it up to feature length. The core story still sits at the heart of the film but a additions at the start and the end along with some padding in the middle brought it up to its 87 minutes. While none of the additions were bad the incomprehensible sport seemed to me to be a joke forced a little to hard. On reflection and a quick reread of the original story the ending is probably, saddly a little two Hollywood. Maybe something less action orientated and closer to the heist movie theme that works so well earlier on. They were almost there but not quite. One last big job to break into a highly secure supermarket knowing it was a trap might have worked. George Clooney and Meryl Streep had a lot of work to do and both delivered good performances. Willem Dafoe’s take on the rat made his my favourite character of the film. It was completely different from his Raven Shaddock performance in Streets of Fire (1984) but just as distinctive. Part of me wonders what his take on Mr Fox would have been. If you need someone to nail that kind of bad guy he’s still got it. Michael Gambon was another exceptionally fine choice for Bean and while I had to check on IMDB Brian Cox was another fine piece of casting. The animation style reminded me of Jill Bennetts illustrations in the book and was very well done. Unfortunately it wasn’t quite up to the standards of say an Aardman Animation but was by no means sloppy. Somehow Aardman’s work looks more cinematic and less like some of the eastern European animations of the 1970’s. However maybe that was the look they were trying for in which case they nailed it. Anyone with the resources or time to do stop animation deserves a great deal of respect. Ignoring my gripes about the way the original material was expanded I’d say it was a very enjoyable 87 minutes. I saw it on the first showing of the day in a screen which I thought I had to myself till someone else left from the very back at the end. Odeon really need to get on top of their cleaning because if the cinema is dirty for the first show of the day what hope is there for the later shows?